Prepare your vase by washing it with dish detergent and bleach. Fill the vase about 1/3 with water. Add a packet of flower food or plan to change the water every couple of days. Remove all leaves that would be underwater in the vase, as they will rot, reducing the life of the flower. Immerse the flower stems in the water and cut off 1/2 inch of the stem underwater. This will allow water to adhere to the pores that uptake the water into the flower. You can then transfer them to the vase. Place the vase in a cool location out of direct sun. To open flowers faster place them in warm water in a warm room. To slow the progress, place them in dark, cool room—if desperate—add ice to the water. 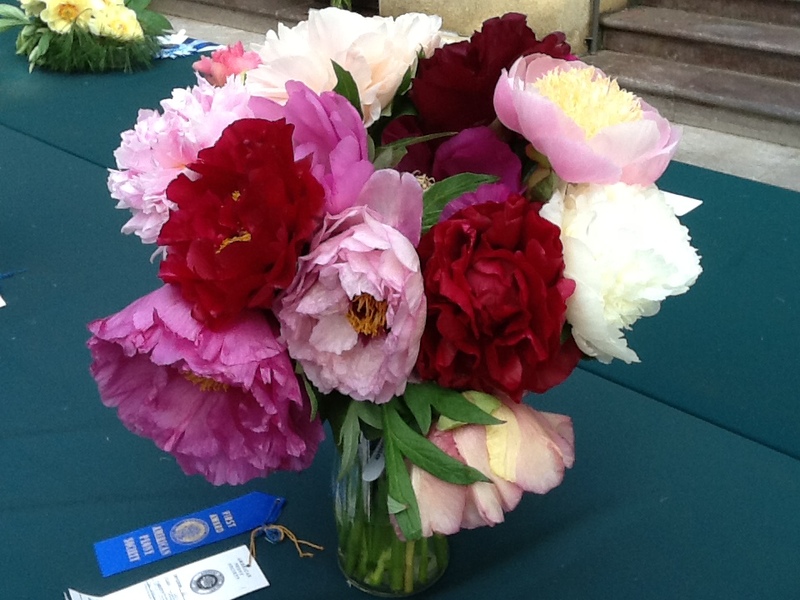 Keep in mind that it will take a couple of years for your peony plant to mature and have lots of stems and flowers to cut. We generally don't recommend cutting flowers from a first year plant, if you must cut the first year, cut short stems and leave as much foliage on the plant as you can. It is best to cut flowers early in the morning while the buds are still cool. Leave at least 3 sets of leaves on the plant to keep the plant vigorous. Most varieties can be cut when the bud feels like a large, firm marshmallow or when you observe the first petal move away from the bud. If you feel a hard marble texture when squeezing the bud the bud is still too tight to cut. Each variety can vary in cutting stage. A single bloom must be cut tighter than a double bloom. When cut in too tight of a bud, the flower may not open. When learning stages to cut blooms it is helpful to take some buds in the house to observe if they will open. Wash and bleach all tools, buckets, and vases to reduce flower contact with bacteria. Place the stems immediately in cool water. Remove all foliage that will be below water level in your final arrangement as foliage will begin to break down under water and give your flowers a shorter vase life. Cut the stem underwater as you are placing it in the arrangement. You will see that a drop of water is still attached to the stem end, keeping it from the air and from drying out. Keep the flowers out of direct sunlight and heat. Change the water in the vases daily if possible to reduce bacteria count. In floral arrangements you might want to use a commercial flower food that contains both sugar to feed the flower and a bacterial inhibitor to keep the water fresh. Flowers shouldn’t be refrigerated with fruit as fruit emits ethylene gas that speeds flower maturity. To hold flowers for a few days, put them in a container of water in a cool, dark place. The optimum holding temperature is 34 degrees, however, refrigerator temperatures will also slow the maturity. Allow 2-3 days for tight buds to open. To hasten opening, place the stems in warm water in a warm place with good light.